AND play in nature! As you play, Mother Nature will gently share her wisdom. Tracking animals in nature is packed full of rich symbolism and metaphor for how you track your own wondrous life. Your relationship with creativity blooms as you develop and practice your tracking skills. Find out what patterns show up and how the tracks speak to you. On this adventure you will discover the ways nature and tracking inform your life and guide you on your personal journey. Walk the land, follow in the footsteps of the majestic giants, feel the lion's roar reverberate through your body, and experience the harmony of nature express a symphony of wonder and awe. We have created a unique tracking adventure in the bushveld of South Africa. Led by extraordinary trackers and the founders of the Tracker Academy, Alex van den Heever and Renias Mhlongo and Master Coach Diane Hunter. Meet the facilitators here. It feels like a "YES!" to experience an exhilarating, life-changing adventure. You are ready to slow it way down and retreat from your fast paced life. You desire to resonate with the powerful presence of nature. Gathering in circle at the end of the day to share learnings and listen to stories told by master trackers lights you up. The animals are calling and you feel drawn to walk the land with the lions, elephants, leopards, giraffes and the rest of your African animal family. Attunement: Tracking cultivates your listening skills. You will learn to tune into a broader frequency of information that informs your actions. Tracking: Learn the art of trailing animals and about your own adaptability, flexibility and resiliency. You will learn how tracking and trailing animals mirrors tracking your thoughts, emotions, energy and intuition. Conservation: Animals are conscious and intentional with the way they move and you will gain a deeper understanding of energy conservation. Connection: Learn and observe through the expansion of your senses how everything is interconnected; animals, plants, water, geology – just like mind, body, heart and soul. Coaching: With me as your coaching guide, we will explore what surfaces on the journey. Community: Share this unique, intimate experience with a small group of fellow journeyers and discover the ways nature and tracking inform your life. Together, we will share an epic experience! What Happens On The Tracking Retreat? Upon arrival on the Londolozi airstrip you will be greeted by the Londolozi staff and transported in jeeps on a ten minute ride to Varty Camp to settle in before the first game drive in the afternoon. If you arrive Saturday, you will have three game drives prior to meeting Alex and Renias Sunday evening. Sunday evening we will dine on the Varty deck with Alex and Renias and learn more about the next four days of tracking and walking the land. 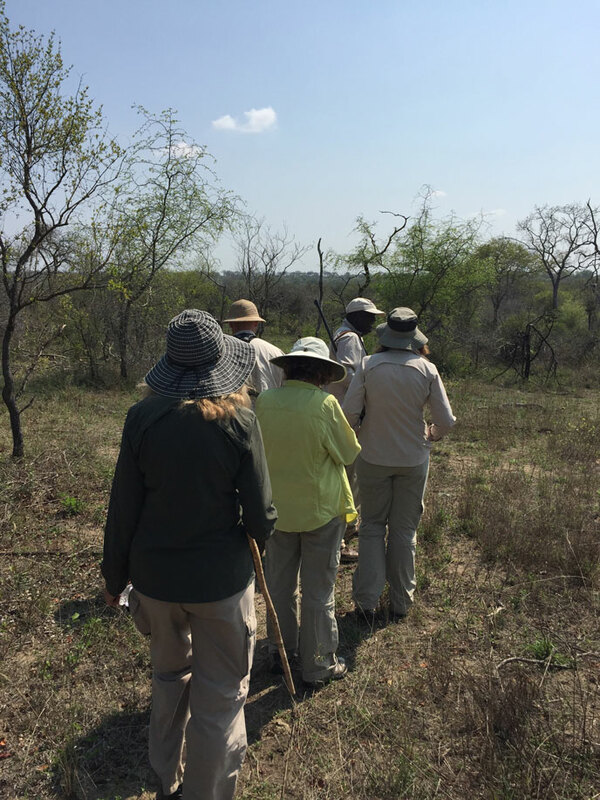 Monday - Thursday, we will spend the mornings in the bush learning about tracks, trailing animals, quieting the mind, shifting into wordlessness and embodying stillness. When you shift from a state of doing to being, your brain wave shifts from beta to alpha which matches the frequency found in nature. We as a group begin to synchronize in our alpha state, and this is when the animals come out to play. Tracking and trailing at Londolozi involves the whole body and strengthens your integration of mind and body. You will walk away with a new understanding of how you see, listen and respond within your environment and how you engage in the relational field. Four or Five nights luxurious shared accommodations at Varty Camp at Londolozi Game Reserve in South Africa. Rooms include a private deck with plunge pool. Private accommodations available upon request for an additional charge. A fifth night may be added to the beginning of your trip before tracking with Alex and Renias begins to settle into the land and experience two additional game drives with a skilled Londolozi tracker and guide team. First-class cuisine for meals plus drinks that include house wines, local spirits and beers. The suburb cuisine at Londolozi is an essential part of the experience and also includes morning morsels, high-tea and sun-downers while in the bush. Tracking experience with Alex and Renias starting Sunday evening at dinner through Thursday morning. Daily yoga class on a newly built yoga deck overlooking the river. Air transport to and from Johannesburg TAMBO International airport to the Londolozi airstrip. If you are signing up on your own, you will be paired with a room mate based on preferences and similarities expressed in a phone conversation. ** Private accommodations available upon request for an additional cost. Email Diane if you would like cost details for private accommodations. This is a very unique opportunity to learn the skill of tracking and trailing and experience how nature mirrors life. Tracking is a physical, visceral experience that you will carry with you as a reference point to track and create your life. Thank you to Diane for putting together the most inspirational tracking adventure in South Africa. Tracking the animals on the Londolozi reserve was more spectacular than I could have imagined. I will always remember the opportunity to track a rhino and how we found two males in a territorial dance. Our tracking led us to rhinos with their young, a heard of breading elephants and their young, lions - lone male, a pride and mating Lyons. I was in awe and impressed with how close we came to the animals while in the vehicle. We sat near the tree were a leopard and her two cubs lounged after eating their kill. We saw a Cheetah chase it's prey. There were antelope, warthogs, giraffes, monkeys, baboons and zebras. We learned all their tracks, the vegetation, and the history of the land. I fell in love with the country, the sunrises to the sunsets. The hospitality, delicious food, and accommodations were an added plus. I recommend you gift yourself this incredible opportunity to experience tracking in South Africa. Curious to explore this experience for yourself? Please enter you name and email address if you would like to schedule a call with Diane to explore if this is the experience for you. Due to the nature of this retreat which includes exclusive time with exceptionally skilled trackers, the following policy is in place. Any cancellation made over 120 days prior to the retreat is fully refundable minus any processing fees. 50% percent of the registration fee will be refunded for a cancellation made more than 60 days prior to the retreat. A cancellation made within 60 days of the retreat is non-refundable unless there is someone available to take your spot.